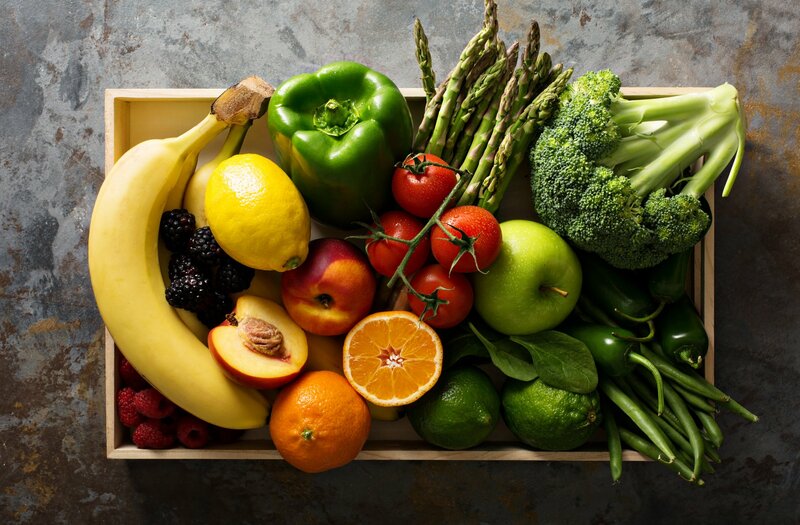 Are you in the habit of washing fruits and vegetables you buy from grocery stores or farmers markets before eating them? It is easy to think of nature’s bounty as a pure source of good nutrition that can’t have any ill effect, but unfortunately, that’s not the case. Think about the last time you went to the grocery store. Did you pick up a piece of fruit or vegetable, turn it in your hand and check for ripeness before setting it back down? This is common practice and a lot of people aren’t so meticulous about keeping their hands clean. Another thing to think about is that the farmer could have plucked the fruit with dirty hands or grimy machinery. Ewww! And we haven’t even talked about the use of pesticides that are used to protect crops from insects. 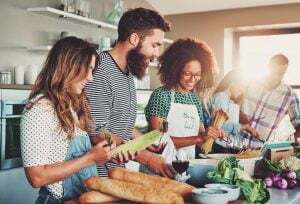 These factors can potentially lead to unsafe handling practices that can spark outbreaks of E.coli or other long-term health issues that can lead to serious health problems. So what are we trying to say? You need to get in the habit of washing your fruits and veggies! Cleaning your produce isn’t difficult, but most of the time running them under water isn’t enough! In supermarkets, you will find packaging for certain products that read: Double or triple washed. This may be enough but it doesn’t provide enough of a guarantee as a lot of produce, vegetables especially, have deep crevices or areas that might not be exposed to running water. A few years ago, NPR looked at a Cook’s Illustrated study to determine the best method to� cleaning fruits and vegetables� . The outcome? Using a scrub brush removes 85% of bacteria while diluting 1 cup of white vinegar in 3 cups water works to remove 98% of bacteria. Because that is the most effective method for clean food, it’s what we want everyone to use going forward. It is also very easy! For smooth-skinned produce, you can fill a spray bottle and coat the surface of your produce 6 or more times, let it sit for 30 seconds, then rinse. Lettuce, Kale, broccoli, and other produce with areas that are hard to clean need to soak for 2-minutes in the same 1-to-3 solution of white vinegar and water. Note that leaves should be separated to ensure complete coverage. To prevent cross-contamination clean your sink when finished! That leaves one final question: Tap water or filtered water? The point of washing our food is to ensure total food safety! As we recently wrote,� filtering tap water isn’t all that expensive. There are chemicals in our water supply� like chlorine that kill bacteria but leave behind unpleasant tastes and can damage the cells in our body. Plus, contaminants are proving to be an ever-present threat even in large cities where we would clean water would be more important when� hundreds of thousands are at risk. So yes, you should definitely filter your water before cleaning fruit or vegetables! Whatever you expose your food to leaves a risk of contamination. 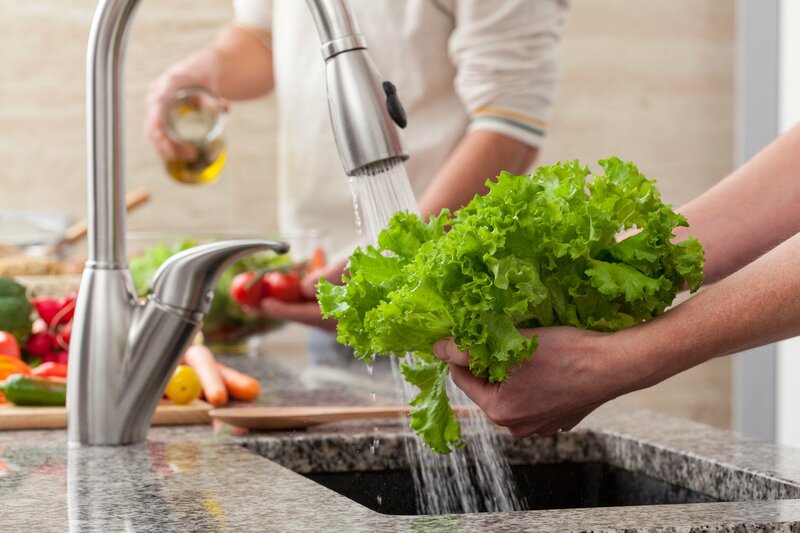 Since it’s easier to clean vegetables in your sink, we highly recommend a� water faucet filter or� under sink water filter system. Faucet filter systems either twist onto the end of the spout or sit between the water line and the faucet. Under sink systems stay out of sight though require tools and a little know-how to install. Either solution gives you cleaner water at the turn of a handle. Remember, filtered water is marginally more expensive than tap water alone, with most water filters capable of removing waterborne contaminants from hundreds of gallons of water before they should be replaced. What do you say? Will you start washing your fruits and veggies?